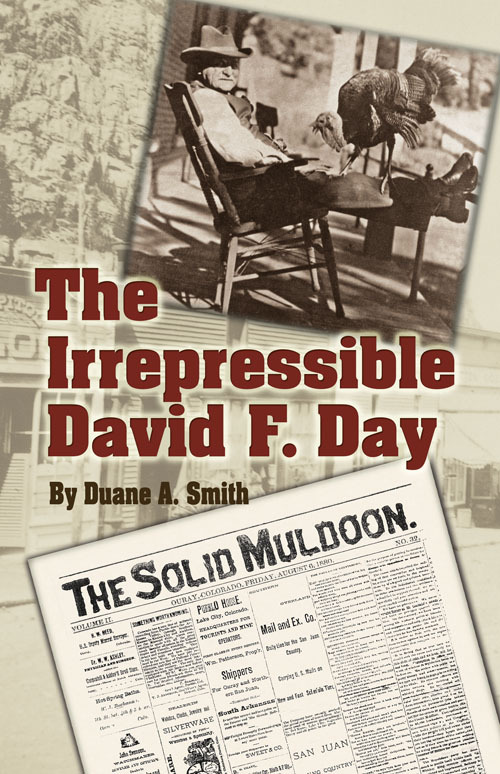 David Frakes Day, editor of Ouray, Colorado’s Solid Muldoon and later The Durango Democrat, was the most hated and loved newspaperman of the late nineteenth century – exactly the type of honor a newspaperman of his time would have hoped for. He loved a “no-holds-barred” controversy and did not hesitate to jump into any type of literary fray. Although he always thought that he was fearlessly fighting for truth and justice, Day’s writing was as caustic and stinging as any of his day. This resulted in some great humor – of course, only if you happened to be on Day’s side of a particular issue. His “special” way with words also made him numerous enemies for life. He was threatened, but never coerced; and his quips and comments were often read and quoted in other papers and by prominent politicians. Although Day’s work has been quoted often, before The Irrepressible David F. Day, very little has been written about the man himself, even though he led an exciting life during a fascinating time in Colorado and American Civil War history. In this book, author Duane Smith provides details of Day’s Civil War service and his migration to and life in Colorado, while touching on some of Day’s personal problems. However, Smith also provides page after page of his favorite Dave Day quotes, which can still bring smiles to readers’ lips, even today.